I stayed up late last night to check out the spectacular full moon. What, you didn't stay up late to take a look? 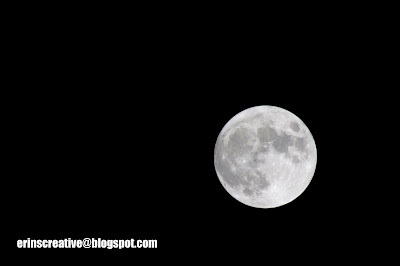 That's okay, because my favorite photo this week is of the full moon. It was a challenge to get the shot. I busted out my tripod, a different lens and took a TON of photos to get it. It was totally worth it! I also learned a lot about shooting a ridiculously bright object in NO light. So, you get to enjoy the product of my trial and error. Is that not just completely awesome?!?! I enjoy the stars (when I get to see them) and the moon. It gives me peace and now sadness. I wish the space program were better funded, because I believe there is so much to learn when we explore. Very nice!! I posted some last night too of the moon. It was beautiful.